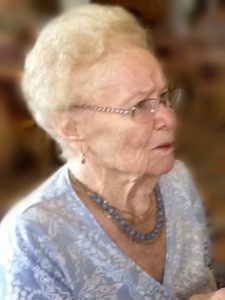 Kiss Stella Mary (nee Lopachuk) Passed away May 5, 2017 at the age of 94. Beloved wife of the late Emil P. Kiss; devoted mother of Carole K. Mackrell (James), Emil P. Kiss, Jr. (Debbie) and the late Steven R. Kiss, mother-in-law of Nancy Kiss; dear sister of Anne Rindfleisch; also survived by 9 grandchildren and 6 great-grandchildren. In addition to her homemaking role she was very active in the General Federation of Women’s Clubs being a founder of the Women’s Club of Erdenheim, serving as President of the Montgomery County Women’s Clubs and also on the National Board. She was a member of the Montgomery Co .Republican Party and a Judge of Elections. She volunteered at the former Norristown State Hospital and with the American Red Cross. A long time member of Questers she found time for bridge, bowling and casino trips. She was always reading, making sure to cover “The Inquirer” and its crossword puzzle daily and all family members have their own afghan from her skilled crocheting. Relatives and friends are invited to her Mass of Christian Burial at 10:30 A.M. on Wednesday at St. Genevieve’s Church, 1225 Bethlehem Pike, Flourtown, PA 19031 where friends may visit from 9:30 to 10:30 A.M. followed by Interment at Holy Sepulchre Cemetery. In lieu of flowers a memorial donation may be made to the American Red Cross (www.redcross.org). Knew Stella for many years. Sorry to hear of her passing. Stella was a lovely lady, always cheerful and a faithful member of GFWC. Stella will be missed by many, many friends. Stella was a dear friend and a dedicated clubwoman. We will miss her, and a donation will be made in her memory to the GFWC Pennsylvania Foundation, of which she was a founder. Stella was one of the best. I enjoyed all the times we spent together, She helped me while I was state president and I will never forget her jokes and fun way!